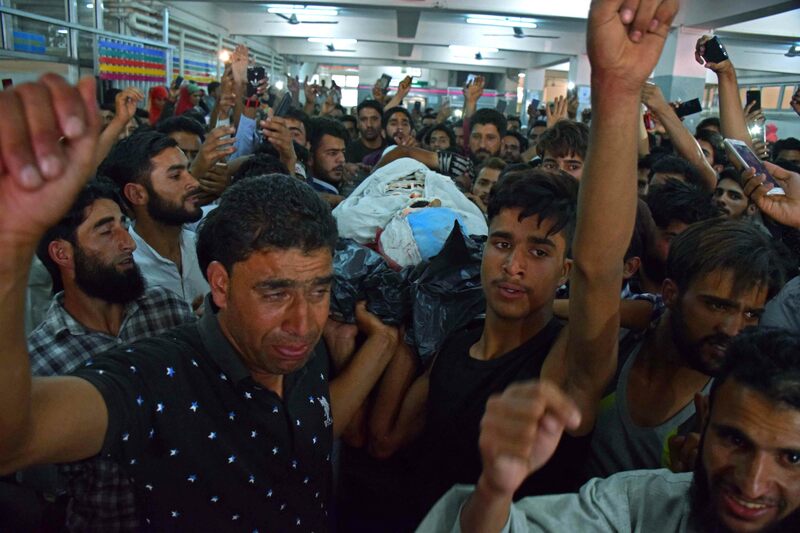 Srinagar, September 03 (KMS): In occupied Kashmir, Indian troops in their fresh act of state terrorism martyred one more youth and injured dozens in unprovoked firing on protesters in Pulwama district, today. The martyred youth identified as Fayaz Ahmad Wani was killed after the troops fired bullets, pellets and teargas shells on defenseless protesters during a cordon-and-search-operation in Gusoo area of the district. The injured were shifted to Pulwama and Srinagar hospitals. Earlier, the troops associated with Rashtriya Rifles and personnel of Central Reserve Police Force and police launched cordon and search operations in as many as 15 villages of Pulwama district and conducted door-to-door search. The locals hit the streets against the Indian forces’ actions and raised pro-freedom and anti-India slogans. Srinagar, September 03 (KMS): Prominent freedom leader and the Chairman of United Jihad Council (UJC), Syed Salahuddin has said that the Indian agencies are targeting his children and relatives to prevent him from taking part in the freedom struggle. Syed Salahuddin in a statement said that such attempts could not affect his role in the freedom struggle. Srinagar, September 03 (KMS): In occupied Kashmir, the Joint Resistance Leadership comprising Syed Ali Gulani, Mirwaiz Umar Farooq and Mohammad Yasin Malik has commended people’ steadfastness and unity in strongly opposing the tinkering with hereditary state subject law challenged in the Indian Supreme Court by anti-Kashmir agencies and organisations. Syed Ali Gilani, Mirwaiz Umar Farooq and Mohammad Yasin Malik in a crucial meeting held at Hyderpora in Srinagar said people of Kashmir have always stood up and resisted every move of occupation and subjugation. Srinagar, September 03 (KMS): In occupied Kashmir, Indian troops in their fresh act of state terrorism martyred one youth and injured dozens in unprovoked firing on protesters in Pulwama district, today. The youth identified as Fayaz Ahmad Wani was killed after the troops fired live ammunition on defenseless protesters during a cordon-and-search-operation in Gusoo area of the district. The troops fired bullets, pellets and teargas shells on protesters. The injured were shifted to Pulwama district hospital and SMHS hospital, Srinagar. Hurriyat leaders Mohammad Yousuf Naqash and Javed Ahmad Mir in their joint statement in Srinagar strongly condemned brutal killing of civilian Fayaz Ahmad Wani by the Indian troops in Chewa Pulwama during a cordon and search operations in the area. Jammu, September 03 (KMS): In occupied Kashmir, the Jammu and Kashmir Freedom Movement (JKFM) has denounced the arrest of youth in Mandhar area of Poonch district and demanded their immediate release. Srinagar, September 03 (KMS): In occupied Kashmir, Hurriyat leader and the Chairman of Jammu and Kashmir Peoples League (JKPL), Mukhtar Ahmad Waza has said that Kashmir is a political dispute and should be settled through political means. Mukhtar Ahmad Waza addressing a condolence gathering at Damhaal khashipora in south Kashmir’s Islamabad district asked for initiating a meaningful dialogue between India, Pakistan and the genuine leadership of Kashmir to resolve the lingering dispute. He said that Kashmir was not against people of India. “We want economic progress in the region for which the settlement of Kashmir dispute is inevitable,” he added. Srinagar, September 03 (KMS): In occupied Kashmir, Hurriyat leaders and organizations have condemned the continued violent operations and use of brute force on protesters by the Indian forces in South Kashmir districts. Srinagar, September 03 (KMS): In occupied Kashmir, Hurriyat leader and the Chairman of Islami Tanzeem-e-Azadi, Abdul Samad Inqilabi said that India had occupied the territory by the dint of military might. Srinagar, September 03 (KMS): In occupied Kashmir, the Kashmir Editors Guild (KEG) on Monday trashed charges against detained journalist Aasif Sultan and maintained that the police statement was too vague to be accepted as a reason. The Guild in a marathon meeting in Srinagar discussed various issues including the arrest of journalist Aasif Sultan by Indian police. Srinagar, September 03 (KMS): In occupied Kashmir, complete shutdown was observed in Boniyar area of Uri in Baramulla district against the murder of a minor girl.